Harvest 2016 is in full swing in San Diego county! Curds and Wine is here to help guide you in choosing the best yeasts for your fermentations, and we offer a wide variety of other ingredients from basic nutrients to enhancing enzyme preparations to make the best wines. We also have equipment for rent to crush and press your wines - contact us to reserve your equipment as soon as you estimate you will need it. We offer some basic in-house wine chemistry testing, but for more in-depth analysis our friends at Vinmetrica offer a wider array of tests. Curds and Wine has compiled a red wine making summary and basic shopping list to help you find everything you need for your fermentations. If you missed our comprehensive Basic Winemaking from Fresh or Frozen Grapes 2-part seminar series, we will offer another Crash Course on Saturday September 10th at 1 pm to cover the basic information you need to make wine from grapes this season - see details below. This course would be especially useful if you are purchasing grapes from West Coast Grapes for the first time - and don't forget, if you are ordering grapes let us know to enter the drawing for a free bucket of juice! Join us at Curds and Wine to learn the basics of making wine from fresh grapes! We will go through the processes involved, chemistry testing, and the equipment you will need, with demonstrations of the use of equipment commonly used for winemaking. *Must be 21 or over to attend. Paid participants ONLY admitted to seminar. Purchase of fresh grapes is not included; grapes must be purchased separately and wine made at home from fresh grapes. No wine is made in this class! Purchase tickets at the shop or online here. This is our last grape winemaking seminar for 2016! We are here to help you get some fresh grapes for your home winemaking this harvest season! We will once again be a pick-up point for fresh grapes from West Coast Grapes, pricing and availability is now online for 2016. 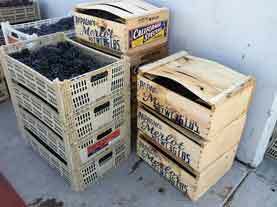 Grapes are purchased directly through West Coast Grapes, we are a pick-up point only, no sales on site for these grapes! Please note, we cannot store these grapes, they will start spontaneously fermenting if you do not pick them up the day they arrive. Grapes will arrive at Curds and Wine for pick up on Saturday October 1st. Your name will be called when they locate your order, and you will be responsible for picking up your boxes from the delivery truck. We cannot give a specific time as orders will be pulled from the truck as they were loaded, but the truck should have most orders unloaded by 11 am - please plan to spend a few hours as it takes time to unload the grapes from the truck. We will have a crusher/destemmer available to process these grapes for a $25 processing fee for up to 500 lbs, another $10 fee for every additional 500 lbs; crush tickets must be prepurchased at Curds and Wine or online before you take your grapes to get crushed. We will have a crush list on delivery day, please check in with a Curds and Wine representative at the crushers to get on the list. Please remember to bring containers that will fit in your vehicle to transport the must back home as the grapes arrive in open wooden or plastic boxes. Please note: only grapes delivered from West Coast Grapes can be processed on site at Curds and Wine, all other processing must be done off site and equipment returned clean and in working order. As a bonus to Curds and Wine customers, we will have a drawing for a free bucket of juice from West Coast Grapes! For every box of fresh grapes you purchase from West Coast Grapes to be picked up at Curds and Wine you will get one drawing entry. Please send us a copy of your purchase receipts for the drawing; the drawing will be held Friday September 23rd and the winner will be announced on our Facebook page and by Twitter. The winner will be notified by email so they can place their order for their bucket of choice out of the available buckets listed on the gift certificate you will be given (choice of merlot, cabernet sauvignon, barbera, sangiovese, zinfandel, syrah, chardonnay, pinot grigio, or sauvignon blanc juice). This bucket of juice will be brought to Curds and Wine with the fresh grape deliveries. Only submitted entries will be part of the drawing, West Coast Grapes will not be providing us with a list of customers. Send us your proof of purchase to enter the drawing. Each year RJS Craft Winemaking offers home winemakers an exclusive selection of outstanding wine kits, developed to feature the best results from grape harvests around the world. Because these kits are special and unique, each 18-liter "RQ" kit comes with its own artfully designed labels and bottle dressings. Due to the nature of these kits, they are only available in 'Restricted Quantities', and must be pre-ordered before they're available to ship. 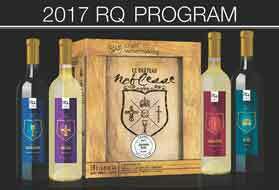 The 2017 RQ Program, titled Le Château Noblesse, highlights the original noble grapes of France - Cabernet Sauvignon, Chardonnay, Merlot, and Sauvignon Blanc. These are classic French wines that remain true to their centuries-old heritage. For winemakers who know and appreciate the difference, this year’s RQ collection offers the opportunity to experience the pure essence of these varietals as expressed by their native French terroir. The reds include RJS’s GenuWine Winery Dried Grape Skins for elevated structure, tannin, and age-worthiness, and are finished with French oak. Both reds and whites include varietal-specific yeast for optimizing color and bouquet. Experience true nobility with elegance, grace, luxury and valor. Born of accidental breeding in 17th century France, L’âge d’Élégance has inherited its flawless balance of subtlety and daring from its wildly rich parentage. Complex and concentrated with spice notes, red fruit and vanilla on the nose. This is a rich, full bodied wine with structured tannins and a long finish. Centuries old, cultivated by French monks, and named for the village of Chardonnay, L’âge de Grace is a wine that is both simple and regal. Densely textured with a steely minerality and creamy mouthfeel. This is an unoaked Chardonnay with notes of citrus, honey and melon on the palate, finishing with crisp green apples. Named after the French bird Merlau, this late 17th century wine is the epitome of L’âge de Luxe, known for being luxuriously ripe and soft. Ruby red color with aromas of juicy blueberries and cherries on the nose. This luxurious wine features ripe cherries, blueberries, a touch of spice, and soft tannins on the palate. Named from the French word sauvage, meaning wild, this valiant vine once grew wild in France. L’âge de la Vaillance is refreshingly crisp and dry. Pale lemon color with pronounced aromas of grapefruit, grass and gooseberries. This classic wine is dry yet invigorating, with flavors of citrus and grassy notes on the palate. **Preorders are due in at Curds and Wine by Sunday October 9, 2016. If you do not preorder these kits availability is not guaranteed when the kits are released in 2017. 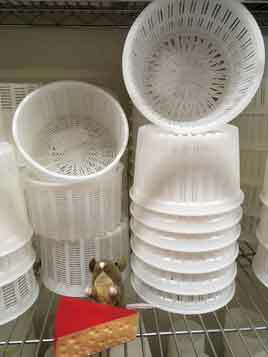 Curds and Wine now has Canestrato and Basket cheese molds in several sizes. These molds will make a nifty pattern on the surface of your pressed cheese. 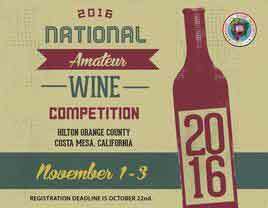 The American Wine Society Amateur Winemakers Competition has been held annually for over 40 years. American Wine Society (AWS) certified judges and industry winemakers score and critique submitted wines. AWS judges have completed a rigorous 3 year training program, supplemented by extensive hands-on experience and periodic recertification. These judges are often sought out and invited to participate in major US wine competitions. Details and entry form can be found online here. You need to enter 2 bottles of wine per entry, to be shipped to Murrieta, California. The Award Winners will be announced at the 2016 AWS National Conference in Hilton Orange County, Cosa Mesa, CA. Winners will also be posted on the AWS website by December 15th. You do not need to be a member to enter, or to attend the conference! Good luck, and please let us know if you win any medals. If you are interested in becoming a member and joining a local chapter, please let us know.